Light: Giving time, money, or effort to a charity. Taking part in a group effort. Lending your resources to others without expecting anything in return. Making sure everyone is treated equally. Working together toward a common goal. Redistributing wealth, time, or attention. Tithing. Sharing credit for your success. Shadow: Making a loan as a means of gaining control over someone. Using charitable acts to draw attention to yourself. Dividing work or resources unfairly. Failing to do your part in a group effort. Ignoring obligations and commitments. Story: The Main Character wins by cooperating instead of competing. Relationships. In a healthy relationship, partners help each other. Healthy partners agree on rules for dividing up chores, financial responsibilities, and social roles—and then honor those commitments. Define what equality means for you, and help each other achieve it. Work. Learn to delegate. Many people, working together, can achieve more than one person, working alone. So what if some people contribute less and still get credit? Good managers will recognize star contributors and reward them accordingly. Spirituality. A mature soul seeks to come to the aid of others. This may involve traditional charity: giving time, money, or effort. Don’t forget, though, that prayers and compassionate meditation can also change the world for good. Whatever form of service your spiritual path encourages, offer it with sincerity and regularity. Personal Growth. Charity is based on a simple principle: we should all look out for each other. Self-interest comes naturally; interest in others and their well-being is the hallmark of maturity. Putting the needs of others first can ease your progress toward a balanced life. Fortune Telling. When you need help, ask for it. Remember, though: what you receive may be limited by what you’ve given to others in the past. When? Between May 1st and May 10th. Scales. 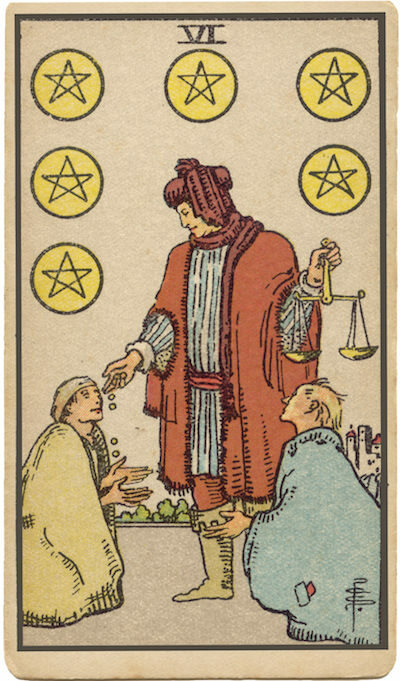 Many versions of this card incorporate an image of a man with scales, doling out charity to grateful recipients. The scales emphasize the fairness with which his charity is delivered, making it possible for each person to receive exactly what’s needed. In your own circumstance, what role does fairness play? The Nature of Charity. The wealthy merchant on many versions of this card won’t miss a gold Coin or two, but the money he distributes could make a huge difference to someone less fortunate. Keep an eye out for a small gesture that could make a big difference in someone else’s life. The Lone Giver. The wealthy merchant can help a few, but his “lone wolf” approach to charity will have its limits. What role does isolation play in your situation? How might joining a group of some kind influence your future? The Marseilles Image. An elaborate vine divides six Coins into six virtually equal compartments: a place for everything, and everything in its place. With this image in mind, explore the equal division of responsibility in your own situation. To what extent is everyone pulling his or her weight? How do I feel about charity? About giving it? About receiving it? How can I know if I’m treating others fairly? What could I give that no one else can?